Today's Thursday Thoughts are about weddings! Today is my wedding anniversary! For those of you who are new readers to our blog, I was married at Disney's Wedding pavilion located at The Grand Floridian Resort. It was about 98 degrees that day! We had a simple wedding of just family and close friends but it included many magical Disney touches that I will never forget. Here is a very brief peek into what our day was like! Scott is traveling for work this week so we won't be able to do anything to celebrate, but we will be leaving for Disney again REAL SOON......So I think that is a great way to celebrate. As for me, I had been asked to take some engagement photographs today for a very dear friend who will be getting married later this year. So maybe that's a little symbolic that I get to participate in some wedding related stuff on my anniversary? Are you married? What are some ways you've celebrated you anniversary? Happy anniversary! You pretty much had my dream wedding! Thank you Stacie! I really couldn't have asked for anything more! I always wondered who actually got married at Disney!! Your video gave me a little tear so sweet. You look gorgeous and I love Cinderella's chariot. Congrats enjoy your day. We are coming up on our 20th anniversary crazy! Surprisingly LOTS of people get married at Disney. The wedding pavilion is just one location you can chose. Getting married in the countries in Epcot is another of many other options. Congrats on your upcoming 20 years! Happy anniversary! I watched the video and have to admit that I teared up a bit because it looked like such a beautiful wedding, and you look so happy. It will be awesome for you two to celebrate at Disney soon! happy Anniversary to you too! Yes, I cant wait to be back at Disney in a few days! Happy Anniversary! Here's to celebrating when you're at Disney for TOT! Thank you! I'm getting excited! Happy Anniversary! Lots of September weddings/anniversaries- you, Lauren, my parents, and I went to 2 weddings this month! Thank you! It was a great day. Happy Anniversary! Disney weddings always look SO beautiful! Thanks Lauren! Disney does a great job at making everything so beautiful! Happy anniversary! Your wedding looked amazing! Thank you Ness! I couldn't have asked for a more perfect day! Happy Anniversary! I love Disney weddings they are always so touching and sweet! Disney does a great job of making each event so special! I'm dying... that was always my dream! DISNEY WEDDING! So beautiful! Thank you Rebecca! I never really gave a Disney Wedding much thought until we just decided on it one day. I'm glad we did! Thanks Lauren! Disney really does a great job with everything! Happy Anniversary! 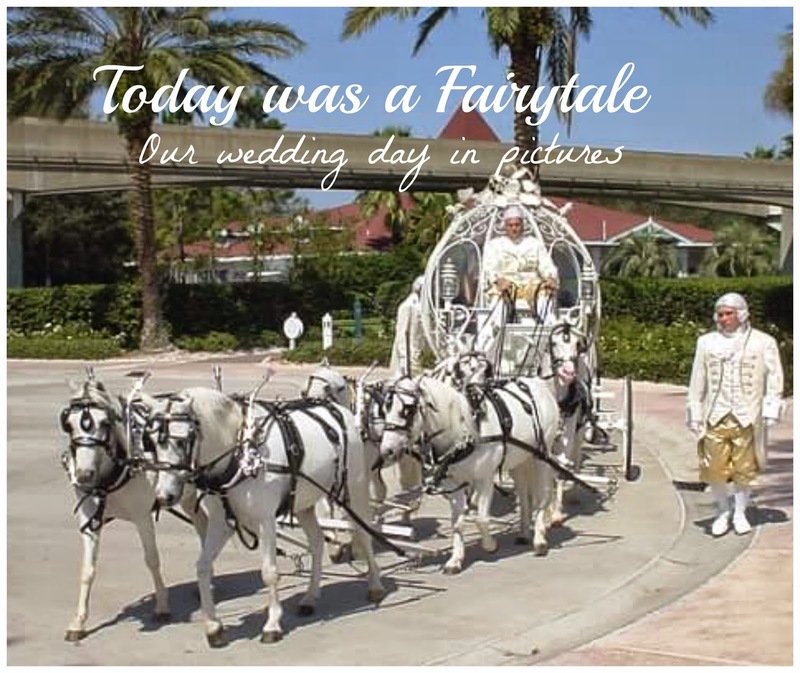 Your pictures are beautiful, I love how you had the Cinderella carriage, you really did have a fairytale wedding! The Cinderella Carriage was definitely my favorite part! You couldn't have a fairytale wedding without the carriage, right? This fall will be 9 years! Congrats! Beautiful pictures! Thank you! Fall is a great time for weddings! Congrats on your upcoming anniversary too! You lived out the fairytale Meranda....perfect name for your blog. Beautiful photos too. Thank you! Now you know why we love Disney so much! Lovely pictures! It's my dream to get married in Walt Disney World when I find my prince! Happy happy anniversary! That truly is magical. I hope you have a great celebration! Happy anniversary!! I've never been to a Disney wedding- it looks very magical! !